The third Shenandoah (AD-26) was laid down on 16 September 1944 by Todd Pacific Shipyards, Inc., Ta-coma, Wash.; launched on 29 March 1945; sponsored by Mrs. Daniel Hunt; and commissioned on 13 August 1945, Capt. Albert C. Burrows in command. Shenandoah completed her fitting out in December and sailed to the east coast, via the Panama Canal, where she reported for duty with Destroyer Force, United States Atlantic Fleet in January 1946. Until June 1947 she tended destroyers in various east coast ports; primarily at Norfolk, her homeport. The tender deployed on her first tour of duty with the 6th Fleet from June through August 1947. In the next 20 years, she was assigned 13 more tours in the Mediterranean. 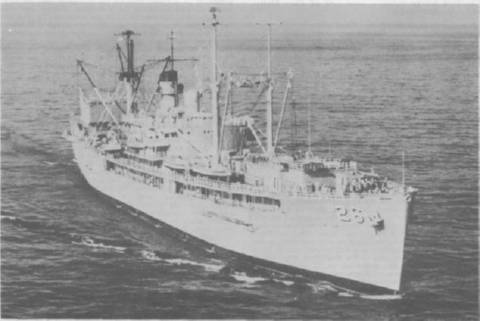 Shenandoah's most publicized tour of duty was in 1964. She won international acclaim for her heroic rescue of the crew of the Dutch merchant ship Doris. The freighter broke loose from her moorings during the height of a storm and became impaled upon the rocks of Molo San Vincenzo in Naples' outer harbor. A line was run to the freighter by the crew of the Shenandoah, and all aboard were rescued minutes before Doris rolled over and sank. The destroyer tender also won recognition in 1965 for her repairs to the bow of the carrier Shangri-La (CV-38) which had collided with a destroyer during maneuvers. Shenandoah was awarded the Battle Efficiency Pennant for her competence in destroyer tending in 1952 and 1956. She was awarded the Engineering E in 1958 and 1965, and the Supply E in 1962, 1963, and 1967. Shenandoah was again deployed with the 6th Fleet in 1968, 1970, and 1973. She returned to her home port on 15 December 1973 and into July 1974 is tending ships on the east coast.